Narrowband imaging with a color camera is not only possible, but I have found it to be an excellent way of adding detail and structure to my astrophotography images. If you currently own a one-shot-color camera or DSLR, I highly recommend trying some narrowband filters with it such as Ha (Hydrogen-alpha). 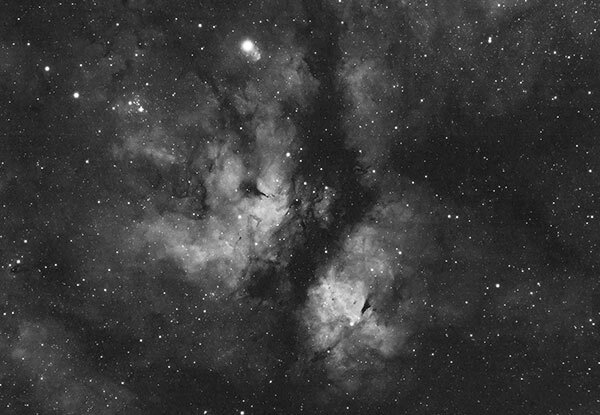 Ideally, you’ll use a monochrome astronomy camera for narrowband (and LRGB) image, yet owners of color cameras can still tap into the benefits of narrowband imaging before taking the big leap to mono. An example scenario is someone with a one-shot-color cooled astronomy camera such as the ZWO ASI294MC Pro. With this camera I shot countless deep sky images using a duo-narrowband filter that isolates Ha and OIII. Images captured using a color camera and duo-narrowband astrophotography filter from the city. My latest encounters capturing narrowband images with a color camera have once again opened my eyes to a new level of astrophotography possibilities. In this post, I’ll share my results using a color CMOS sensor camera through Ha, OIII, and SII filters. In the past, I found that by collecting narrowband data such as H-Alpha with a DSLR, you can complement your broadband (true color RGB) astrophotography. This is great news for DSLR astrophotographers that want to amplify their deep sky imaging. The ongoing learning curve involved with astrophotography continues to provide me with endless moments of victories and defeat. 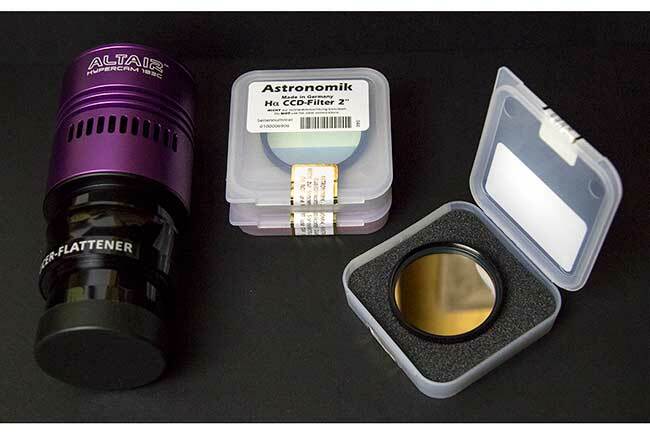 This time, I’ve experimented using an affordable one-shot-color camera: the Altair Hypercam 183C – with a set of 2″ round mounted 12nm Astronomik filters. Astronomik 12nm Ha, OIII, and SII narrowband filters. My goal was straightforward, to capture a deep-sky image from my light polluted backyard with more interstellar details and nebulosity than ever before. The intense city glow is largely ignored, and the light from the deep-sky target can shine through. 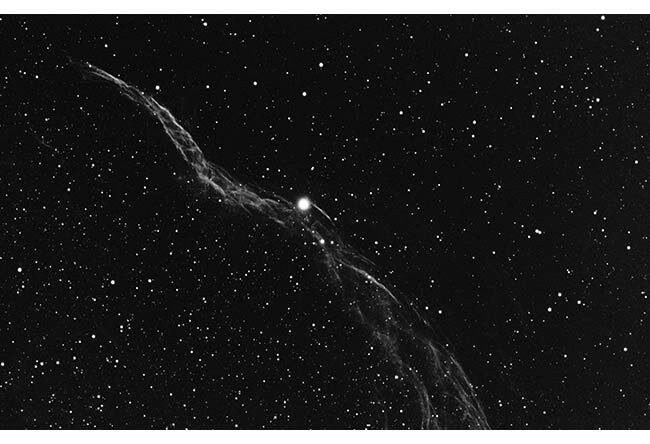 My target: NGC 6960 – The Western Veil Nebula. This time of year offers up an endless amount of narrow band imaging targets. The one I have selected for this project is a supernova remnant in Cygnus – The Western Veil Nebula. 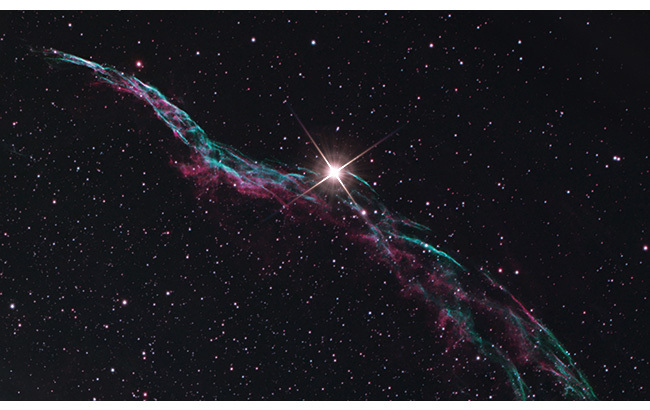 NGC 6960 (often referred to as “The Witch’s Broom”), is an exemplary target for narrow band imaging with a DSLR or color camera due to its composition of hydrogen, oxygen, and sulfur. 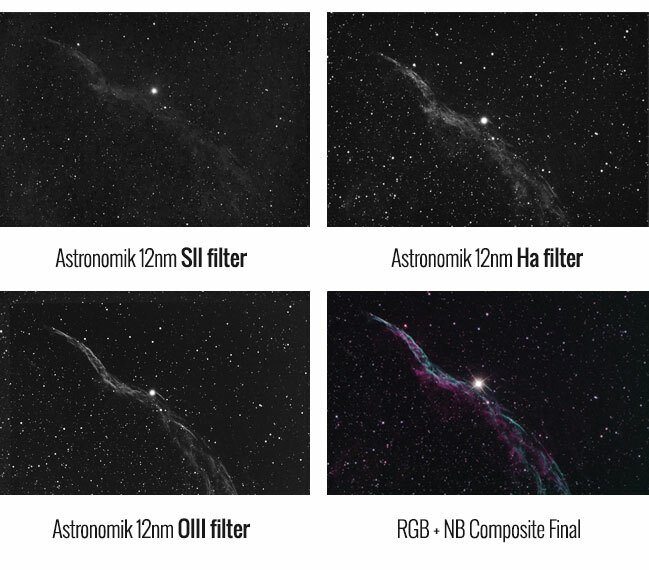 I was given a great deal to buy these filters used from Sean Molony at www.redstickastro.com. You may recognize his name from the work he has done with the Astro Imaging Channel. Thank you, Sean, and keep up the fantastic work. Is narrowband imaging with a DSLR or color camera a waste of time? The astrophotography community made it quite clear that a monochrome camera such as the ZWO ASI1600MM-Pro is the way to go when imaging with narrowband filters. 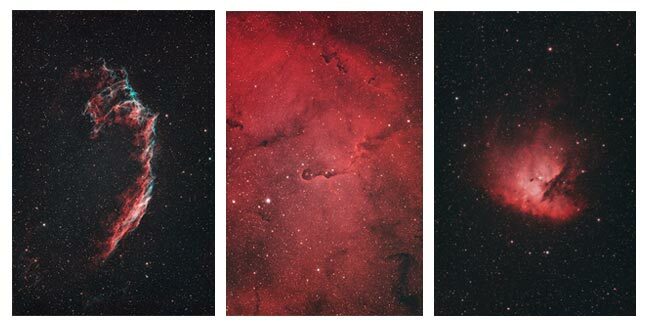 The bayer matrix design of a color CMOS camera sensor cuts the light gathering power by 1/4, meaning less detail is recorded than with a mono astrophotography camera. These warnings have not gone ignored, and every bit of that statement is true. However, the financial position I, and so many other backyard astrophotographers are in, mean that purchasing a new mono camera for astrophotography in the $2K range is not something that can be done quickly. Utilizing the gear I have to push the limits of what’s possible is perhaps my favorite aspect of this enchanting hobby. The Altair Hypercam 183C utilizes an internal cooling fan and open design to reduce noise from the 20MP CMOS sensor. The highly sensitive sensor also benefits from CCD-level controls such as Gain adjustment and produces high-resolution 12bit RAW .FIT images. Update: In early March, 2018 – I tested out a new mono astrophotography camera, the Altair Hypercam 183M. This is the monochrome version to the 183C used in this post. Here is where it gets exciting. If you own a DSLR camera – You too can start reaping the benefits of filtered deep-sky astrophotography from almost any city location. The added contrast and details provided by using narrowband filters with your camera can improve your existing deep-sky photos, and create new imaging possibilities. Sure, a dedicated monochrome camera will perform better in this scenario, but you can start employing narrow band benefits to your DSLR now. 2″ round mounted filters like the Astronomik versions above can be threaded directly to your field flattener/reducer or 2″ nosepiece. They can be used with a DSLR camera or CCD when you upgrade. For the image below, I used an Astronomik 12nm Ha clip-in filter on my Canon EOS Rebel T3i DSLR. The images were exposed for 5-minutes each through a William Optics Zenithstar 73 APO. This is a fantastic example of what is possible with a DSLR camera and small telescope when a narrowband Ha filter is included. Adding Ha (Hydrogen-Alpha) can add a lot of interesting stellar details to your emission nebulae images. I have also recently discovered first-hand at how OIII can make your planetary and supernovae remnant images “pop”. I can, of course, continue to use the Astronomik filters when I eventually do decide to upgrade to a Mono CCD camera. The H-alpha portion of the data acquisition process yielded impressive results. The amount of hydrogen gas in the Veil Nebula was evident in my 300-second exposures using Astro Photography Tool. The data would have been better had I taken the time to capture proper bias and flat frames during the acquisition stage. The OIII image was my hands-down favorite, as the composition of this supernova remnant contained lots of delicate Oxygen light wavelengths. This was a pleasant surprise and exceeded my expectations for narrowband images using a color camera. This time around, I completed the data set with darks, flats, and bias support files. The difference in the image quality was evident right away. The SII stage of the image was the least impressive. 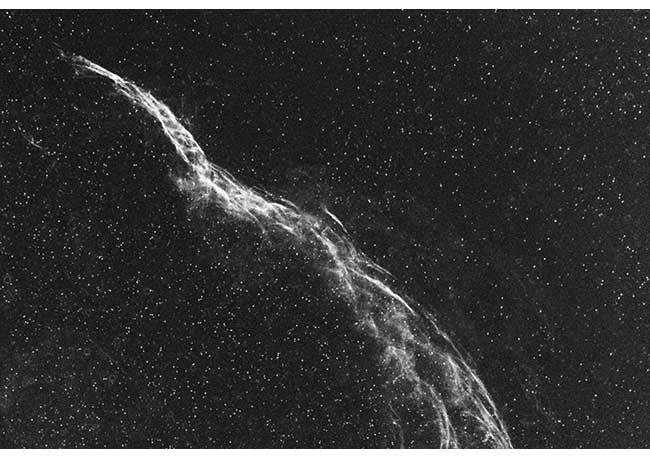 The Sulfur II content in the Western Veil Nebula appears to be much less than Oxygen III and H-Alpha. However, my SII data suffered from a lack of integrated exposure time and poor seeing conditions. Like many aspects of the astrophotography image processing realm, there are a number of ways to go about it. My preferred method is to copy and paste each of the narrowband greyscale images into the corresponding R-G-B channels in Photoshop for a full color (yet false color) image. 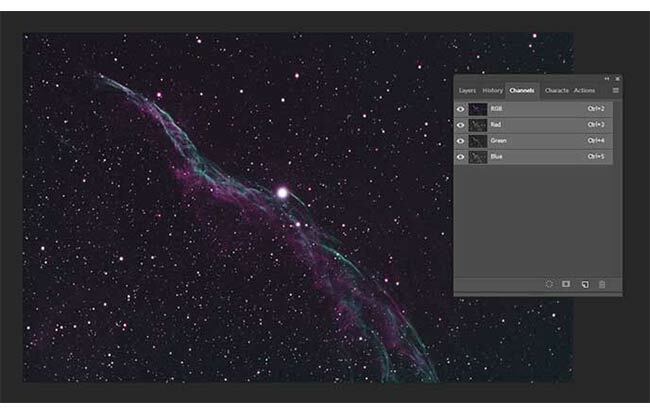 Bob Franke has provided a fantastic tutorial for Hubble Palette Color Map images in Photoshop. This technique creates a false color image by mapping SII, Ha and OIII data as to the R, G and B channels respectively (SHO). This method can produce some stunningly detailed and colorful results. Others prefer the robust features of PixInsight to complete the task as seen in the false-color image in Ha, SII and OII below. The true power of this method is fully deployed when used with a cooled Mono camera. 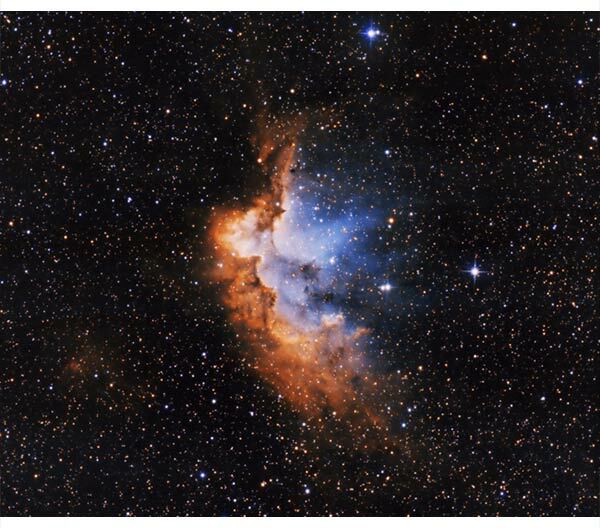 For example, Jay Bolt of DSO Imaging recently completed a narrowband project on the Wizard Nebula using a QHY163m. My personal tastes lean towards a hybrid RGB image that showcases the true colors of the deep-sky object as opposed to the Hubble Palette. That may change as I progress further into narrowband imaging, and crave the intricate details a full SHO image provides. 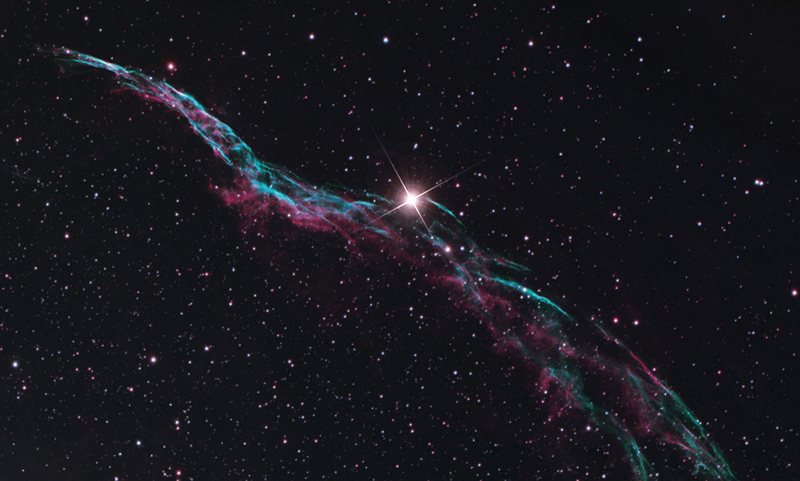 My final photo of the Veil Nebula combines a standard broadband RGB image with narrowband Ha and OIII details. I was not overly impressed with the HST palette version of my image that mapped the NB data to the RGB channels. (R=SII, G=Ha, B=OIII). The RGB data was shot using the Altair Hypercam 183C camera with a Baader UHC-S Filter to block the city glow. The true color portion of the image was used to give the photo a more natural look, with accurate star colors. I am often pushed towards the PixInsight software by my colleagues and friends. My future in deep-sky astrophotography will undoubtedly include PI at a later date. I feel no rush to make this transition, as I would like to reach the full potential of my beloved DeepSkyStacker and Photoshop workflow first. The great news is that the aging (free) registering and stacking software known as DeepSkyStacker works brilliantly at combining this narrowband data. DSS creates smooth, high resolution .TIF images from your collection of individual image frames. When using the Altair Hypercam 183C with DeepSkyStacker, one of the main adjustments I needed to make was the star detection threshold setting. Because of the narrow wavelength of light collected on the CMOS sensor, the RAW .fit images come out of the camera very dark. So dark, in fact, that DSS does not recognize a single star in the field at the default 10% star detection threshold setting. I have found setting this slider from 3-5% effective. You’ll want to include darks, flats and bias frames in your stack, just as you would with a regular color image. My image exposures using the Hypercam 183C in H-Alpha and OII were 300-seconds and 180-seconds, respectively. I shot data in SII as well, but the data collected was of little value due to poor imaging conditions and lack of overall exposure time. My processing steps included the traditional operations of level adjustments, curves stretch, sharpening and noise reduction. The biggest difference this time, as that the data is grayscale and not full color. My OIII image contained the most data in the blue channel. This is the channel I extracted for processing in grayscale. Create a new document, and open the Channels tab. 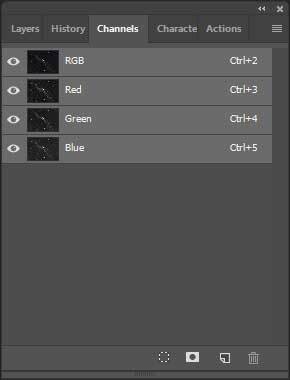 With your pre-processed narrowband images open, copy and paste the main image layer in the corresponding channel for each color. For my RGB+NB composite image, the Ha was used to boost the red channel, OII for the green channel, and a 50/50 combination of Ha/OII for the blue channel. Once the grayscale narrowband images have all been slotted into each channel, the new false-color RGB image will reveal itself. You can adjust the color levels independently by making curve adjustments to each channel. When the color balance is to your liking, final processing can be applied to the final RGB image as a whole. I enjoy the Astronomy Tools Action Set and continue to utilize the useful 1-click actions when processing in Photoshop. Some of the actions applied were “Increase Star Color” and “Make Stars Smaller”. The StarSpikes Pro filter was used to create a synthetic diffraction spike on the star 52 Cygni. I also created and applied a master luminance layer using the Ha and OII grayscale images for an increase in contrast and structure. This is a powerful image processing technique that can be enjoyed after collecting narrowband images with a color camera. If you’re looking to retain the natural colors in your galaxy or nebula, adding the narrowband data as a luminance layer is the answer. I absolutely love the look of natural color stars and appreciate the idea of seeing space as it truly exists to our eyes. This is common practice when shooting deep-sky objects with a Mono CCD in LRGB format. The L stands for luminance as its only job is to collect as much light as possible. The same concept can be used when shooting narrowband images with a color camera, it just takes much more time. The additional detail gathered by using a narrowband filter such as Ha and OIII make for a detailed master luminance layer in your final image. Meaning, the only the highlights, and contrast from the data can be harnessed without affecting the natural color of your deep sky photo. The legendary Doug Hubble of the Astrophotography Tutorials YouTube Channel and myastroimages.com shares a useful tutorial on creating a master luminance layer from your narrowband data in Photoshop. This process involves first removing the stars in your astrophoto and then applying the image using the screen blending mode to your existing color image. As always, it is my pleasure to share my journey through each stage of backyard astrophotography with you all. I really think that adding a set of narrowband filters to your kit can improve your images from the city, no matter which kind of camera you are currently using. I’ll continue using the Altair Hypercam 183C for the remainder of the summer and share my results. Next up, I’ll review some new CLS/UHC filters from Baader and Explore Scientific for collecting color/luminance data with your DSLR or CCD camera. 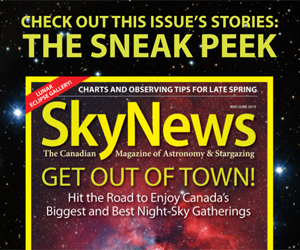 To stay up-to-date, please subscribe to the AstroBackyard Newsletter. A special thank you goes out to Jay Bolt, Sean Molony, and Steve Malia for making this post possible. Until next time, clear skies! Ron Brecher is a leader in PixInsight image processing. Many of the principals shared in this tutorial can also be applied to taking narrowband images with a color camera. Sara Wager is an accomplished astrophotographer with images that have graced the face of APOD multiple times. Simply stunning images which I think will be beyond my talent. You are too kind Stephen. I look forward to seeing your results using your new equipment! Spectacular Trevor! I like how you can image with light pollution and while the moon is out. Got couple of questions now that you are a CCD expert. I now have (or have excess to) a Coronado PST and would like to do some solar imaging with my QHY5-II-M CCD (my autoguiding camera). I started using APT as I don’t like EZPlanetary to run the camera. Is it possible to get a daylight live view like you can with a DSLR do I have to play with the live view at night? 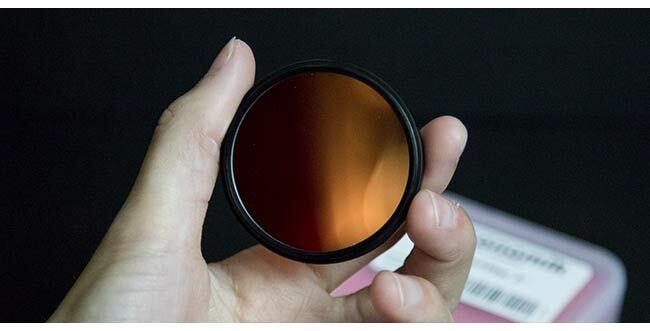 Also, I think one of my next purchases is going to be a 12 nm Ha filter to use with my T3i. Do recommend the clip version or 2-inch version? Looks like your answer to one of my questions would be to get the 2-inch filter if I am reading correctly. Thanks so much for the comment, Colin! Inspiring others to really get into this hobby is the greatest compliment. I am sure you will capture some amazing images in the future, keep in touch! Without exaggerating, I can say that almost everything I can about astrophotography I have learned from you. Especially image processing. Here in Seeden (Gothenburg area) we have to pause this hobby for the whole summer because it does not get dark at night. Your videos and your site are what makes me stand out the long wait to dark nights. Can not thank you enough for all the time you sacrifice to share your successes and adversities with us !!!! Can you elaborate a little bit on how to get a 50-50% mixture in a channel? Thanks Stephan! Using the processed grayscale OIII version as a base – I add the processed Ha image as a new layer on top at 50% opacity. Then flatten the image and use for the blue channel. Jeff – I would definitely try using the 1.25″ filter wheel with your 50D first, before investing in any 2″ versions. I think there will be some vignetting around the edges of your images – but you may be fine with cropping them out. Hi, I am completely new to astronomy and i was thinking to buy a used telescope for first time under 100 CAD. Can you guide me ? should I go for a computerized to go mount? Because I think it is the easiest now a days and I dont even know if I will be able to see moon if I buy a manual telescope. Also I don’t have much budget as of now but I want to see Saturn rings and if I can get the best views I am ready to spend 200 CAD for that. Please reply. Thanks. PS – I reached here from YouTube watching your setup for astrophotography. Hi Amit – You will definitely be able to see the moon and Saturn through a used telescope around the $200 range. The quality of your view would be best in a Dobsonian, as they offer the most aperture for the price. You will not find a telescope for astrophotography at that price – and there are a lot of extras needed to get into that. All the best! Just wanted to say thank you for giving back and being an inspiration. Also I have a question. I live in NJ USA outside of Philadelphia and am in heavy light pollution. I turn 40 in 10 days and am looking to treat myself to an EQ6 as well as mod a sony a6000. Not sure full spectrum or Ha yet. I plan on ccd in long run. What’s your opinion on full spectrum vs. Ha only mod? Hey Paul, thank you! I’m not familiar with the Ha mod – but sounds very cool. Personally, I wouldn’t do it unless I had another camera that could grab color images as well. I am hooked in HaRGB processing at the moment. I would say go for the full spectrum mod, and then shoot filtered H-alpha images when the moon is out. If you go for a 2″ round mounted version, you can thread the filter into your 2″ adapter and use with both your DSLR or a future CCD. Cheers! Excellent points! I forgot to mention the anti-aliasing filter – which indeed can make a big difference. I hope to use the Altair 183M again soon. Thanks!